RUTH Ellis, the last woman to be hanged in the UK, and Marilyn Monroe, died a decade apart. One became a cause celebre in her final weeks, the other was a celebrity in her life. Both were bottle blondes. 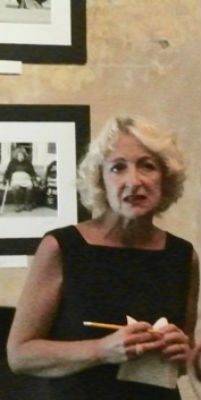 Actress Joan Ellis (no relation) imagined the last moments of both women for her solo show Died Blondes, performed at the Edinburgh Fringe this year and at Frome’s Archangel pub theatre venue on its UK tour. Starting with the murderess who shot her brutal and unfaithful lover, the racing driver David Blakely outside a London pub, Joan Ellis transformed herself with no more than a tightening of the mouth and a change to an authentic faux-genteel accent into the woman who spent her final days in Holloway writing letters. What might her (apparently unwritten) letter to Blakely have said? Their drunken, needy and violent life together, his callous toying with her emotions and her eventual plans to kill him are vividly re-created in this 25 minute monologue that transports its audience back to the early 1950s. Fast forward to California, where film star Marilyn Monroe, addicted to prescription drugs, waits in her Santa Monica home. Was she following her mother’s path to paranoid schizophrenia, or was she genuinely terrified for her life following affairs with JFK and his younger and crueller brother Bobby? In Joan Ellis’s play, performed from behind a screen, Monroe is on the telephone to former husband Joe DiMaggio. Claiming fear of the CIA, and proclaiming her lasting love for the baseball star, Marilyn sinks into death. The two playlets are carefully researched, convincing and beautifully contrasted, subtly observed and never falling into caricature. Another fascinating evening of pub theatre from Nevertheless. Posted in Reviews on 30 September, 2017 .